We at Power My Home have been shouting from the rooftops for many years about how brilliant PV solar panels (photovoltaic) are. “We have recently had a solar heating system installed to provide for our outside swimming pool. We are thoroughly enjoying the benefits of free additional heating which makes our pool both enjoyable and economic and extends the season both in spring and autumn. As gas prices increase the value of energy provided by our panel’s increases, making this very worthwhile investment. “We learned to our surprise that the cost of installing a solar panel system in our home was considerably less expensive than we had believed it would be and so found ourselves able to say ‘yes’ we could afford to have this work done. “As I began to look into the possibility of installing solar panels, I became more and more confused and wary about all the facts and figures and different products, but your company helped me navigate through this sea of solar information and arrive at a system that suited me and my needs. Indeed, my overall experience has been a pleasant one. My PV solar panels got installed, and I am now registered with the electric company to export power, so am like a mini power station and happy in the knowledge that I am doing my bit to be greener. 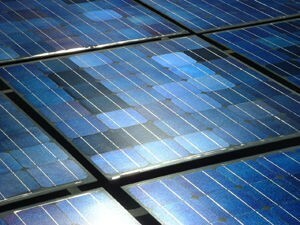 We recommend a PV solar panels installation. “I recently had to take the PV solar meter reading on the anniversary of the installation of our system. In precisely 52 weeks, it generated 3063 kW, earning us some £1311. This technology against a total energy bill for the same period of £950. A profit of £361 & a return of about £12, 750 invested. “As a company, you will naturally play a significant role in the rapid rise of popularity for PV solar systems. As such, it will play its part in the contribution to reduce not only our carbon footprint but the whole country’s reliance on expensive fossil fuels. “We decided to install PV solar panels based on a combination of the index-linked feed-in tariff scheme and our wish to reduce our carbon footprint. Throughout the whole process, of sales, survey and installation, everyone has been courteous, and questions have answered promptly. The installation of our 3.96 kWh system took less than a day and resulted in a very tidy installation. “My wife and I were interested in exploring the possibility of having PV solar panels installed tour property, and we decided to go ahead with the informative information you gave us. “We are not buying anything” My wife’s first reaction when I told we had an appointment with a solar panel surveyor. She jokingly added “if he is too pushy he won’t get a cup of Tea. My interest had been generated by a significant Sunday newspaper article adding the free installation of solar panels (What’s in it for them?) And our long-held belief of financial and environmental benefits of renewable energy. The surveyor gave an excellent explanation of solar energy systems that were easy to follow and understand. Within 10 minutes, he offered a glass of wine; he settled for tea! We installed the 4kW system and found despite the fact that nightfall generated cloud 4.4 units. Even, dark low, cloud during the following two days resulted in still producing 7.2 groups each day. Dark low, cloud giving 7.2 units a day is excellent news. If the sun fails to break through during the next ten years a daily yield plus predicted 50% saving our electricity bills would achieve the 10-year repayment target. With this in mind, sunshine is almost a complete bonus. A sunny day is quite a substantial bonus. Our 10-year repayment target almost seems pessimistic or six or seven years seem more likely with average weather conditions. What’s in it for the free solar panels suppliers. No thanks, keep it for yourself.